As I’ve said time and time again, social media has been such a blessing to me, especially when it comes to the wonderful people I’ve met in my Alzheimer’s and Caregiving community. Kai is one of those people. She blogs at Days with My Father. Here is a post she graciously shared about her feelings and reflection on her dad who she sadly lost on Oct. 22, 2013. Please read her blog and her wonderful stories of her dad. 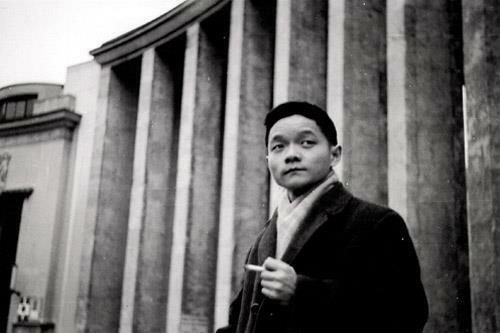 In remembrance of Wei Hsuang Chu, Jan 11, 1935 to Oct 22, 2013. It has been a blurry 3 weeks, since the tail end of my trip away and leading up to my father’s funeral this Thursday. 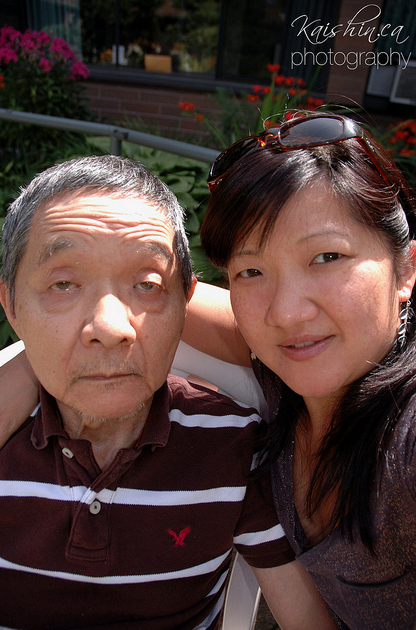 Father’s body is now in the wait for cremation and soon his remains will reside on my home until his birthday come January, where my sister and I will scatter his ashes into the Pacific Ocean… The last few days leading up to the funeral and post, have been surreal to say the least. I had hosted a casual funeral, a viewing without ceremony and formality. My father was almost always happy for company and very casual and laid back, so it was fitting. I had wanted it to be a cozy, loving, environment, for those who knew him to remember the man he was, and for those who didn’t – came out to support me – to feel comfortable in sharing this life experience with me and my family. The funeral viewing went smoothly, minus one or two bizarre comments from family directed at me. Unfortunately these still stand out in my memory, as I process the feelings and thoughts that had resulted in what was said. Its inappropriateness shocked me, but then I realized post event that these people sadly have not let their ego guards down, and are still living in their fear and guilt driven worlds and the wrong attitude on what Love vs. Burdens mean. Little do they realize that I have all the family I need around me, I kept ones who were openly loving and grounded with me through my dad’s difficult journey with dementia, Alzheimer’s, Transient Ischemic Attacks (mini strokes), Atrial Fibrilations, and later diagnosed, congenital heart failure, which were the cause of swellings, weakness, and hard of breathing. Yes, sometimes I felt alone in the journey, from the supporting role, but I wasn’t because my dad was there… maybe not in spirit or the same physical self, but he was a being that still lived. Being told “You are the one who loses”, to the one(s) who thought that, you are wrong. I gained, so much that I get emotional when I think about what I have gained through the last 4 years. I gained deeper unconditional love for my father and sister, it gave me strength to be there for them, even when I wasn’t feeling so strong. I gained deeper empathy and resolve to advocate for those in need, and coach those in need where I can. I’ve come to understand the meaning of life, the true depth of it, and gained a stronger mind in the process. I am more at peace than ever before, I am a better listener and communicator with those around me, more freedom speak from the heart and mind. I’m even better at letting people go, especially those who are no longer a fit, instead of wanting to help or please everyone. Some people think that I am in mourning for the death of a parent, but in actuality, I’m grieving the four years of emotional hardships when I couldn’t afford the time to process and grieve then, I chose battles carefully and tried not to burn myself out. I had four years of slow grieving for the slow loss of my father, and now that the journey has ended, I’m am at peace with his death, it is a blessing, he is free. He has given the ultimate legacy to his family far and wide, everyone has reminded of his quiet and kind nature, as well as his humble and giving nature, all due to his death. This is the silver lining that death of a loved one brings, reminders to the living, a wake up call, to live your life out of love and authenticity. Thank you to the friends who could come out, thank you for showing me love and support when I needed it greatly. It is a surreal experience made better by love and support, special thank you’s go out to those who went the extra mile and making sure I ate well and came to just keep me company, even when I wasn’t sure what I needed. For those who are still in the journey with their parents or beginning it, do it out of love and not responsibility. For the love will permeate and be returned to you in unexpected ways. I am honored to have Leeza Gibbons as my first guest post. I reached out to Leeza and was so appreciative to receive an email from Gibbons who is a TV/Radio Host, Author, Wife/Mother, Alzheimer’s advocate, Entrepreneur and the list goes on and on. Here are her word of encouragement those in the caregiving and Alzheimer’s community. First her words to me. How are you? Thanks so much for your advocacy in the Alzheimer’s community (and for your Twitter support! )….I thought maybe I would provide this little tidbit…for your blog. Again, we are all appreciative of your voice! Thanks Pamela! Leeza Gibbons is one of the best‐known and most well‐loved pop‐culture icons on the air and at the top of her game. She’s also a wife, mother, businesswoman, New York Times bestselling author of TAKE 2, and champion for family caregivers. The spectrum of Leeza’s career in entertainment and news media— combined with her stunning hands on advocacy for health care, wellness, and caregivers—is diverse and impressive. Her on‐camera hosting dominance in entertainment‐news and talk‐show arenas ranges from the most popular entertainment news show in history, Entertainment Tonight; to her award‐winning daytime talk show, Leeza; to, currently, the syndicated TV news magazine show America Now and the weekly TV news show My Generation on PBS. Recognized as a social entrepreneur, Leeza has become one of the leading voices for issues facing family caregivers. After her family’s experience with her mother’s and grandmother’s Alzheimer’s disease, Leeza took action. Her training as a journalist united with her compassion and business savvy when she created the Leeza Gibbons Memory Foundation, a 501 (c)(3); and its signature programs, Leeza’s Place and Leeza’s Care Connection, which offer free services for family caregivers. Over the years, Leeza has become known as a trusted girlfriend, valued confidante, and source of inspiration and information to empower women to show up for their lives with confidence and pride. Whether it’s her scrapbook line honoring the value of memories, her jewelry collection to symbolize transformation, or her beauty products to reveal inner and outer beauty, Leeza develops programs and products to help women claim their strength and rewrite the story of their lives. As you know this blog has been about my journey as a caregiver to my mom who had Alzheimer’s and about the disease and those who serve as caregivers in this area. I have been blessed that it has also served as a vehicle for other caregivers to reach out, not just those in the fight against Alzheimer’s. While we love-giver’s may be advocates for different illnesses, our role, hopes and concerns are the same. Last December I introduced you to Cameron Von St. James whose wife Heather is a survivor of Mesothelioma. I share with you today, Heather’s story in her voice. If you or someone you know is battling Mesothelioma, visit their website http://www.mesothelioma.com/mesothelioma/ at or contact Heather at http://www.mesothelioma.com/treatment/speak-with-a-mesothelioma-survivor.htm. You can also follow Heather on twitter @HeatherVSJ. To read Heather’s story, click on the picture.